Ever drive through a Ballroom? You probably have in Palm Beach. area. For Palm Beach, no other structure could be as important as the Hotel Royal Poinciana (HRP) once was. 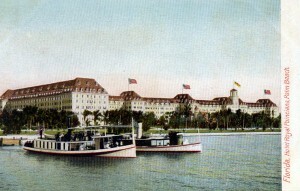 Envisioned as the grand hotel on Lake Worth, Henry Flagler built the hotel in 1893, and expanded it many times until it became not only the largest wooden structure in the world, but the largest hotel in the world. I knew that the HRP was near where the Flagler Museum is today, and that it was on the Lake Worth (Intracoastal Waterway) side of the island. A historical marker in the area indicates that today’s Palm Beach Tower condominiums are on the land where the HRP once stood. But I wondered, where exactly did the hotel stand? Maps of the time didn’t really provide a clue, because so much has changed in roadways; houses and cottages once there are gone too. Then I stumbled across detailed maps of West Palm Beach the Sanborn Company prepared to estimate rates for fire insurance (http://en.wikipedia.org/wiki/Sanborn_Maps). The University of Florida has scanned the pre-1923 Sanborn Maps of Florida cities and towns, and the maps provide a rich history of buildings that once stood in many Florida cities (http://ufdc.ufl.edu/?c=SANBORN). 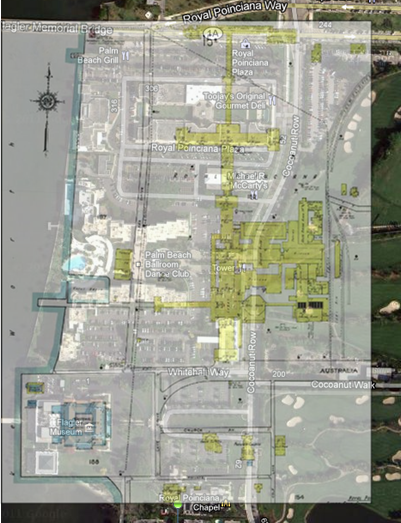 Included in the maps for West Palm Beach are the maps of Palm Beach, with incredibly detailed maps of the HRP, even listing how many night watchmen would be on duty and information on all buildings on the site. I took this map and overlaid it on a modern aerial photograph from Google maps. My only points of reference were the then Flagler residence with the small road in front, the shoreline of Lake Worth, and Royal Poinciana Way. These points allowed me to scale and place the hotel exactly on the modern landscape. And then I saw it. Today’s Cocoanut Row roadway, just north of the Flagler Museum, cuts squarely through the ballroom of the Hotel Royal Poinciana! The ballroom is the small octogon shaped room on the picture above. Countless rich and famous people danced on that floor; the biggest event of every HRP season was the George Washington Ball, and the event would have had its grandest moments on that ballroom floor. thousands of guests among its 1,500 rooms at a level that wealthy persons would be satisfied with had to have been a monumental task! The local area supplied much of the fruits, vegetables and fish, but other meats and foodstuffs all had to arrive by train or steamer in an era with little or no refrigeration. As time went by, many factors contributed to the HRP’s demise. It’s design was considered old-fashioned by the 1920s, the buildings were badly damaged in the 1928 hurricane, and the Great Depression all led to the hotel’s closing and demolition, completed by 1936. The photographs and postcards are a part of the Florida State Archives, the University of Florida digital collection and the Library of Congress Archives. 3 Responses to Ever drive through a Ballroom? You probably have in Palm Beach. So cool! What a great idea with the maps. If only we could travel back in time to experience it. It must have been quite magnificent! I am enamored by the history of the island and appreciate the time it takes to put all of this together to recreate what was a fascinating period in time. Thank you so much. Thank you for this piece. The history of the long lost Hotel Royal Poinciana is important to the heritage of the town. Helping interested visitors and residents envisage the huge impact this hotel had on our past, and the entrepreneurialism of the H. M. Flagler, is relevant to our future as well as our past. I’ve done various overlays with maps from many sources and Google Earth. Your image is the first public attempt that’s any good. Keep in mind that the Slat House vestibule is right on the Hotel’s North South axis where it was constructed to fill the damaged void from the 1928 hurricane. 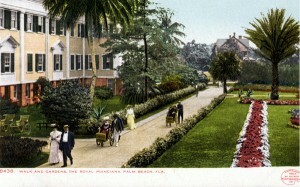 The Hotel property North boundary finished just before the railroad track, which is now Royal Poinciana Way, and the Palm Beach passenger depot which stood about where road entrance to Royal Poinciana Plaza is today. Keep in mind that Flagler built railroads. Laying track was easier than building road. Under Florida’s generous land-grant laws passed in 1893, 8,000 acres could be claimed from the state for every mile built. Flagler would eventually claim a total in excess of two million acres for building the FEC, and land development and trading would become one of his most profitable endeavors.